In response to the high level of interest in the first workshop, I have added a second one. See Workshop page for links to details and registration. The fee is the same at both locations. This entry was posted in Caning, Classes/Workshops, Kaleidoscopes, Teaching and tagged Carol Simmons, Color, Color Mixing, Kaleidoscope Canes, polymer clay, Polymer Clay Classes, Polymer Clay Colorado, Polymer Clay Teachers, Polymer Clay Techniques, Polymer Clay Workshops. Bookmark the permalink. 5 Responses to 2nd Workshop Just Added! 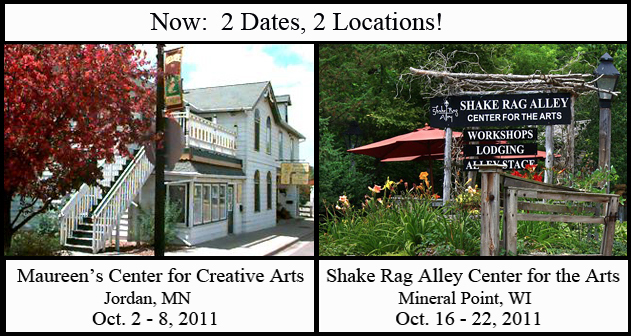 I just registered for the Mineral Point, WI location. I can’t wait. It sounds like fun. I’m excited you are coming, Beth! Are you doing any more Kaleidoscope Intensives anywhere this year that are not full yet? I hope so! Thanks for sharing your work here. The ones that are definite are full, but we are working on one in California. I’ll keep you posted! I am teaching a 6-day intensive in Snohomish, WA, Aug 23-29. There is one opening left.